Map of the Railroads in the United States in Operation and Progress to accompany a report from the Treasury Department by Israel D. Andrews. Communication from the Secretary of the Treasury, transmitting in compliance with a resolution of the Senate of March 8, 1851, the Report of Israel D. Andrews, consul of the United States for Canada and New Brunswick on the Trade and Commerce of the British North American Colonies, and upon the Trade of the Great Lakes and Rivers; also, notices of the internal imporvements in each state, of the Gulf of Mexico and the Straits of Florida, and a Paper on the Cotton Crop of the United States., (1852 editon). Very good condition. Backed with linen. Contemporary color. Four sheets joined. 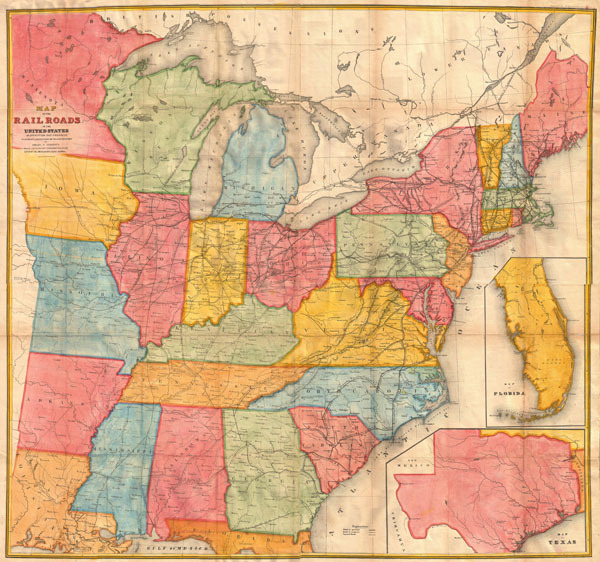 Modelski, Andrew M., Railroad Map of the United States: A Selective Annotated Bibliography of Original 19th-Century Maps in the Geography and Map Division of the Library of Congress, 25. New York Public Library, Map Div. 01-5292 (McLellan edition). Library of Congress, Map Division, G3701.P3 1852 .A52 RR 25.